Discover Angel Pro's NEW Magne-Gelly Polish! A revolutionary magnetic Gelly Polish nail lacquer used to create stunning nail art designs in six metallic shades that will instantly transform your manicure from normal to ravishing. Get the wow futuristic factor with this revolutionary Magne-Gelly Polish that lets you create unique nail art effects in just seconds. 3D, special effects magnetic Magne-Gelly Polish are the latest craze this season and the boldest fashion statement. This unique formula has been specially created with metallic particles to form a pattern on the nail using magnetic forces. Holding the magnet over the nail, before curing the Magne-Gelly, will allow the iron powder in the formula to move towards the magnet to form a pattern for an extraordinary finish. Try Magne-Gelly Polish today and see the magic transform your nail tips! Angel Pro GELLY BASE coat is specially formulated for an incomparable bonding ability and will give GELLY POLISH the best anchor to hold onto. It can be easily soak off in 5-10 min without damage to your nails. GELLY BASE coat contains none of the harming chemicals found in traditional Base Coats like Formaldehyde, Toluene, Toslamide or Toluol. 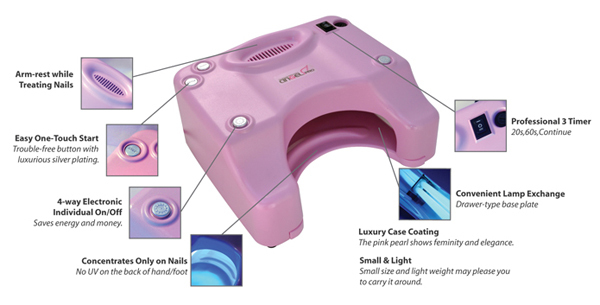 Angel Pro GELLY SHINE is a fast drying top coat that cures under both UV & LED Lamp Systems. It has the highest gloss-shine & durability of any product on the market. GELLY SHINE can be easily soak off in 5-10 min without damage to your nails. It contains none of the harming chemicals found in traditional Top Coats like Formaldehyde, Toluene, Nitrocellulose. Angel Pro GELLY POLISH colours glides on brilliantly & lasts weeks without losing shine, breaking, chipping or smudging. Even more amazing is it soaks off easily in 5-10 min without damage to your nails. GELLY POLISH contains none of the harming chemicals found in traditional Nail Enamel like Formaldehyde, Toluene or DBP. 7 New Christmas Series Colors (GP169 - 175) Launched Now! Angel Pro Acrylic Powder is a powerful combination to our Monomer Liquid, AngelPro Acrylic Powders completes the essential part for the perfect nail enhancements. This powder system is ideal for experienced technicians working in warmer climates. *This product is ideal for advanced technicians. Angel Pro Dehydrator balances pH and eliminates moisture from the nail in preparation for other services – in only 3 – 5 seconds! Readies the natural nail plate for primer, glue or enamel, creating a perfect seal. Nail Lacquers - Creates a longer lasting bond for applying nail lacquer to natural nails. Gel/Acrylic Nails - Strengthens the bond for applying acrylic nails. The Angel Pro Primer is formulated to penetrate the nail, releasing moisture and oil in preparation for nail enhancement. Creates a perfectly dry work surface, assuring maximum adhesion of enhancements that results in zero pop-offs or liftings. Eliminates dry, cracked cuticles and significantly enhances the appearance of the nails.Bring nails to a high-shine buff in seconds and protects against fungus and bacteria with its tea tree content. Angel Pro Liquid Monomers is an advance blend of EMA monomer system designed for increased adhesiveness and a quick hard finish. With this innovative formula, we’ve eliminated two greatest threats to a successful nail enhancement – color discoloration and prone to lifting problems. Smell cleaner air as you work with Angel Pro Liquid Monomers. There is a distinct reduce in odor and simplicity in its application techniques, as compared to similar products on the market. This would mean you would be able to attract more health-conscious customers and less wastage for each application – just the formula you require for your road to success! *This product is ideal for advanced technicians. Our brushes have a firm belly for the perfect application for all types of procedures. Angel Pro Crystal Dapping Dish is transparent and allows see-through vision on the amount of liquid used. Access your liquid with ease with no spillage & wastage. 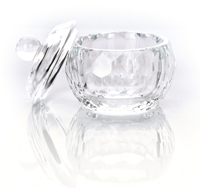 Each crystal dish comes together with a crystal cap to minimize exposure to fumes. Angel Pro Design & Color Powders are the other part of the powerful equation for perfect nail enhancements. Available in five new & innovative, got to-have-it colors series(12 pieces each series); you will be ensured a mouth-watering experience playing with such a wide palette of tones!! All color & glitter powders work best with Angel Pro Liquid Monomer for consistent color every single time. Our colors are precisely formulated to the highest industry standards Nail to nail, jar to jar, to ensure you the highest level of color performance. No foul smell, No allergy, No Tightening Discomfort. Easy Workability & Application.Self-Leveling,No Filing, High Glass-like Shine. Acrylic Nail Systems usually takes 45~60 minutes to remove. Traditional Gel Nail Systems needs to be manually filed off. Use in place of traditional nail polish after your manicure for color-stay of more than a week. Angel Pro Soak-Off Clear Gel is used as both the base & top gel in your application. It's special dual characteristics allow it to have great adhesive power; it can also be easily soak-off & removed without damaging your natural nails. It is honey-like in texture and is brushed onto a prepared nail, then cured for 60-80 seconds under an Angel.Pro UV-Lamp. Two coats are so thin, that even close inspection would not show anything artificial, just the look of well-cared natural nails. Angel Pro Soak-Off Extend Gel is a flexible-hard gel that offers the unique feature to sculpt strong durable but flexible gel extensions. For people not wanting to wait for natural growth, AngelPro Soak-Off Extend Gel can be used to form nail extensions onto the natural nail, and unlike some other systems, an AngelPro extension is thin, flexible and natural looking. Artificial tips are stronger and better looking with AngelPro Soak-Off Extend Gel applied over them, without appearing thick and false. Despite its hardness, AngelPro Soak-Off Extend Gel can also be easily soak-off without any damage to your natural nails. Because of its hard nature after curing. it is also used as a nail hardening treatment to strengthen & support, weak, brittle or soft flaking nails; helping them to grow naturally into strong, healthy, good looking nails, without the use of tips or extensions. Angel Pro Gel Brush Cleaner keeps the brush hairs flexible and resilient. It also helps the brush last longer. This gentle cleanser removes every particle of product residue from both synthetic and sable-hair brushes, without damaging or drying out the fibers. Angel Pro Gel Cleanser has a refreshing sweet smelling tone that is loved by many nail technicians. This gentle yet fast-working solution removes the sticky residue after curing a last layer of AngelPro Clear/Extend Gel, it leaves your gels absolutely in high shine with no damage to enhancements. Angel Pro Gel Base Bonder virtually eliminate lifting with its maximum strength adhesiveness. Angel Pro Gel Bonder is formulated to maximize the bond between nail keratin protein and gel enhancements for the ultimate superior bond while maintaining natural nail healthy. Use AngelPro GelBonder in conjunction with any conventional powder and liquid system. AngelPro GelBonder contains no Methacrylic Acid. Angel Pro Super Shining Top Gel is "liquid-like" clear gel that is applied onto your acrylic or gel enhancements as the final coat on your artificial nails. Cured under the Angel Pro UV lamp in 3 minute, it is ready to go as it does not require any cleansing after curing. Angel Pro Super Shining Top Gel protects and prolong the life of all your enhancements, ensuring a dazzling finish that last & last. Angel.Pro Shining Oil is specially treated and triple refined to produce the "pore-penetrating" effect when applied onto the UV-cured gel nails. The fragrance free oil can seep through AngelPro gels to reach & nourish the natural nail plates beneath. When used with Angel Pro gels, this specially formulated shining oil can revive the gel dullness to it's original high shine! In the market's cuticle oil is unable to achieve this effect. AngelPro Shining Oil also acts as a cuticle moisturizer and protection when applied to the nails; this oil is safe on the skin and lips too. Angel Pro Nail Shield acts as a layer of temporary "base coat" for your acrylic & gel enhancements. Perfect for every technician who requires numerous practise on real natural nails. Angel Pro Nail Shield allows damage-free removal of acrylic & gel enhancements from the natural nails by soaking in warm water. Angel Pro Soft Gel Brush - Flat are designed specifically for use with Angel Pro Soak-Off Gel product range. The brush is perfect for smooth & fast nail coverage. It is also ideal for making details like clean crisp lines. Clean brush regularly with Angel Pro Brush Cleaner for a longer brush life-span. Angel Pro Super-UV LAMP has a timer and 4 x 9W UV bulbs, each individual bulbs has it's own designated buttons & can be individually switched off/ on. There is also a removable hand rest, making it comfortable for your client. You will need to remove the hand rest when changing the bulbs. Angel Pro Soak-Off Color Gel Set consists of 14 colors (5g) carefully chosen to keep the widest range of customers satisfied. 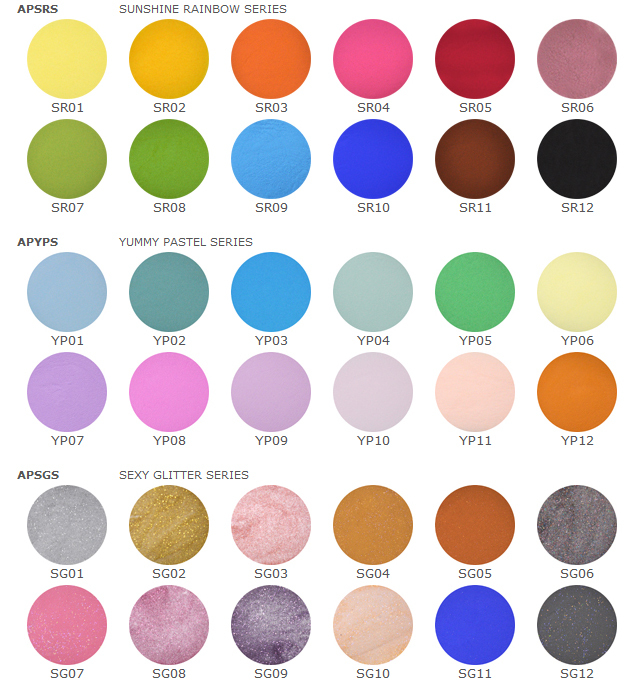 Each pot of colors from our extensive range of 126 gel palettes is rich in color-pigment & glitter concentration; thus using just a bit of color gel gets you the full color intensity. Specially designed for cleaning and preparing the nail without scratching or damaging the nailplate. Double-functions on one single tool, to keep cuticles neat and pterygium removed without having to switch tools! Usage of Angel Pro Pusher ensures nails are fully prep and no liftings & peelings occurring during enhancement applications. Angel Pro Nail Tips creates precise contact area for easier application. Featuring a beautiful natural C-Curve design & straight sidewalls, excellent flexibility & clarity. Perfect Nails begin with the perfect foundation.New Structure nail tips combine the perfect smile-line, C-curve and arch for durable, beautiful result! Angel Pro Cloud Buffer is a 180/280 Grit two-sided file. It has a thick foam center for quick comfortable whisks on the entire nail without hurting any skin. The file is best used before Angel Pro Bling Shiner to buff away any file demarcations when achieving an ultra-smooth surface. Angel.Pro Star File is 100/100 Grit on both sides. It is lightweight and reinforced in the center to prevent file weakening. The file is perfect for sidewall filing and overall shaping on enhancement nail shapes. Angel Pro Petal File is 150/150 Grit on both sides. It is light & easy to handle; it does not break as it is reinforced in the center. The file is ideal for blending tips, cuticle contouring filing & over the top filing. Angel Pro Love File is 180/180 Grit on both sides. It is reinforced in the center to prevent file weakening while being used. It is ideal for creating a smooth-finishing on all nail enhancements. Angel Pro Bling Shiner is used after Angel Pro Cloud Buffer to create the glossiest finish. An easy two-step action that can is used on both natural& artificial nails. The ultimate shiner can bling up a mirror-finish on the nails in seconds! For further information, please visit www.AngelProNail.com.